A lot of our crew meetings tend to happen in other coffee shops or cafes, to give us a chance to take some time to review what we’re doing in a fresh environment. It also gives us an opportunity to be inspired by what other places are doing, and to support other small businesses doing something very similar to ours. Also, we really do love cafes! We feel that the relationships between small business is so very different to larger chains, with competition being quite meaningless and co-existence and co-operation being a key element of success. For us, other good independents are part of the community and valuable to us in many ways, not competition in a bad sense – although lots of good places do keep the standards up for all of us! Last week, we headed to the new Coffee Room at 7 St James Road. This is a new venture by another of our favourite places, Dock ‘o the Bay on the Avenue (a fab restaurant which also have some very beautiful murals!). 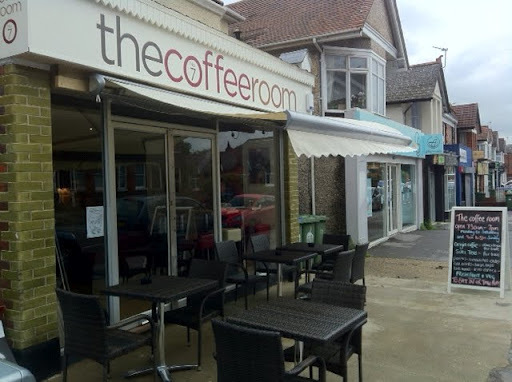 The Coffee Room follows the same business model as Dock ‘o the Bay, in that it’s located in a residential area, where it can serve the local community as well as people travelling specially to the venue. This certainly seems to be working as there were plenty of people coming and going whilst we were there and a lively atmosphere. Most importantly, the coffee was up to our high standards, fair trade and made properly so it tasted smooth and not burnt. The tea was loose leaf, and served really nicely on a wooden board, in a proper pot. The staff were friendly and there was more than one sofa. Win all round! The food menu is simple but tasty, with chunky sandwiches, little pots of crudites and dips, fresh fruit pots and paninis. We were really impressed with the prices which offered very good value. There was also a selection of fresh vegetables on sale, we thought this was a great idea as there are so few greengorcers left, it’s great to have a choice away from supermarkets. The space was quiet enough to have a good conversation (important! ), we felt perfectly comfortable staying there for a few hours and there was Wifi. 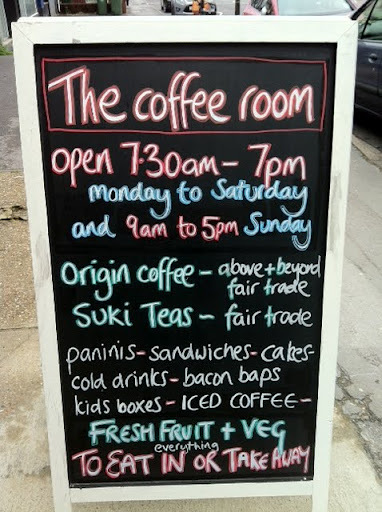 The Coffee Room, 7 St James Rd, Southampton, open 7.30am – 7pm. This entry was posted in Our history, Uncategorized. Bookmark the permalink.